The strange thing is that, despite our suggestions otherwise, the Nature folks chose a not-the-most-interesting figure from the paper. Of course, I’m more than happy that they showed any of our awesome figures! 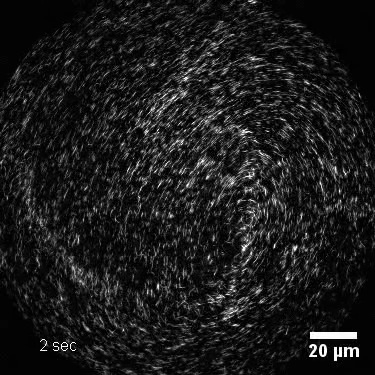 But, instead of showing one of the super-resolution images that Hsiao-lu made, the highlight shows a proof-of-labeling image, which is diffraction-limited. 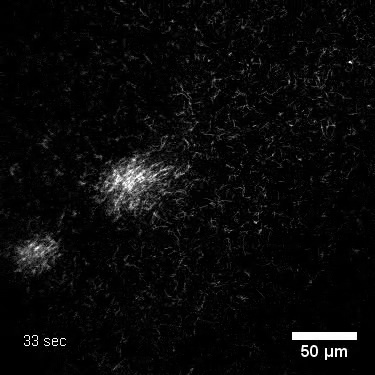 That said, they did select one of the live-cell images. I suppose it could be worse: they could have picked one of the controls. Or not displayed a figure at all. Thanks Nature. I don’t mean to look a gift horse in the mouth. should i join the postdoc union? Royce Murray doesn’t like blogs. No that’s an oversimplification of his editorial. Actually, his worry is that science blogs are more fun and easier to read than real science journalism (which, by the way, is hard to find); meanwhile, bloggers have no required credentials, no accountability, and might just be lying to everyone. UPDATE: In case it isn’t clear, Royce Murray is one of my favorite chemists and teachers. UNC is my Alma Mater, and I really appreciated his class. While most bloggers are pretty unhappy with Royce’s editorial, I wasn’t offended. I basically agree that neither the public nor scientists should be getting information from blogs without a grain of salt. Especially this blog. I’m sarcastic 83% of the time. And Scotch tape graphene won the physics prize. Weird. Graphene is very new and basically unapplied as yet. But the Nobels are supposed to go to discoveries, and pulling graphene off of graphite with Scotch tape is a discovery. And it was cross-coupling for chemistry (our #16 prediction): Heck, Negishi, and Suzuki. Oops, we mispredicted Sonogashira. I don’t know enough about organic reactions to know if this was the right move, but most folks are saying Negishi deserved it. Read Paul’s liveblogging of the announcement. Now just waiting for Twitter to win the Peace prize! UPDATE: A guide to reporters by Chemjobber. i hope this isn’t faked…. Not that I have any reason to think that these results are faked. They just seem so crazy and beautiful. Animated, even. I gather you have got the coordinates of your model or some worked out. Do you think we could have a copy of what you have? The crystalline data is clearing up nicely. To think that Rosie had all the 3D data for 9 months & wouldn’t fit a helix to it and there was I taking her word for it that the data was anti-helical. Christ. We have redone a lot of the 3D more accurately on mouse & will need all the extra accuracy for dealing with some of the finer points. Regards & to Odile too. P.S. I think I have a flat. This is the first time I have had an opportunity for a detailed study of the picture of Structure A, and I must say I am glad I didn’t see it earlier, as it would have worried me considerably. I hope the smoke of witchcraft will soon be getting out of our eyes. It sounds like her colleagues didn’t like her too much. But there was friction from the beginning: Wilkins thought that Franklin was going to work for him … or at least they would work together on DNA … and Franklin had been told that she would work independently. What a mess. But on the other hand, it seems Franklin made some serious mistakes interpreting her data and was quite abrasive. No angels here. No devils (or witches?) either. I suspect that if everyone had worked together and been friendly, Watson and Crick would have proposed the correct structure much earlier. Not only that, but I think Franklin would have been given more credit by the boys. But that’s just my speculation. I just know that I’d prefer to collaborate with folks than fight with them.